I read this book very slowly, but I think it's best that way. It's meant to be savored and the chapters are so short (2-4 pages), it's easy to stop whenever you feel like it. 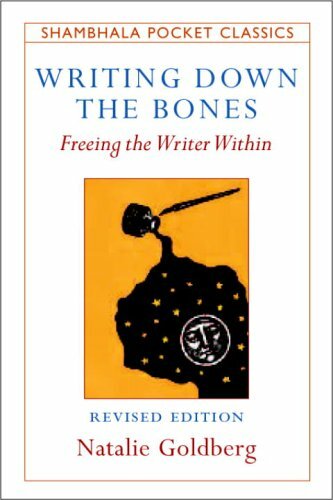 Goldberg has a lot of nice thoughts/recommendations regarding writing, but she also approaches writing in a different kind of way. She's a Buddhist and often mentions zen practice and spiritual leaders. I'm not into that sort of thing, so I'd just disregard it. She also seems to write a lot of nonfiction- journals, reflections, memories, etc.- which I'm not so interested in. But generally, I really enjoyed the book, reading little bits of it each night. They got me in the mood to write and made me think about "the craft" in a different kind of way. Pretty good, but not exactly my thing. 1. “Like running, the more you do it, the better you get at it. Some days you don’t want to run and you resist every step of the three miles, but you do it anyway. You practice whether you want to or not. You don’t wait around for inspiration and a deep desire to run. It’ll never happen, especially if you’re out of shape and avoiding it. But if you run regularly, you train your mind to cut through or ignore your resistance. You just do it. And in the middle of the run, you love it. When you come to the end, you never want it to stop. That’s how writing is, too. Once you’re deep into it, you wonder what took you so long to finally settle down at the desk. Through practice you actually do get better. You learn to trust your deep self more and not give in to your voice that wants to avoid writing” (Goldberg 11). 2. Expect nothing great of yourself. Just write, get your hand moving. Feel free and allow your mind and hand to roam. Do this for practice before you sit down to write your story or your novel. 3. If you don’t know what to write, don’t get distracted, but write down everything going through your head, even mean thoughts about yourself, or just rambling about how you don’t know what to say. I'd heard a lot about Writing Down the Bones so I'm glad I was able to finally sit down and read it. I'm hoping to snag its sister book (in my mind) Bird by Bird by Anne Lamott soon. They're the two books I'd always stumble across when looking for books about writing. Hopefully it'll be more my style!